40 Years After The Vietnam War, Some Refugees Face Deportation Under Trump The Trump administration is trying to convince Vietnam to repatriate some 7,000 Vietnamese immigrants with criminal convictions who have been in the United States for more than 30 years. At a public forum at VietAID in Dorchester, Mass., Vietnamese immigrants learn more about changes to immigration policies under President Trump. U.S. officials have been working behind the scenes to convince the Vietnamese government to repatriate more than 7,000 Vietnamese immigrants with criminal convictions. They have all been ordered removed from the U.S. by a judge. Among those facing deportation is Vu, who has lived in Boston for 20 years. He asked not to use his last name because he fears for his safety if he ever goes back to Vietnam. "They don't like me [in Vietnam] because I'm Amerasian. They would tease me and throw rocks at me," he says through a translator, looking down at the floor. "Over here it's much better. No one gives me trouble. No one hassles me, and no one throws rocks at me." The U.S. government is trying to deport Vu over two criminal charges of assault and larceny dating back to 2001, even though both of those convictions have since been vacated. At the moment, however, Vietnam won't repatriate immigrants like Vu. The country only accepts Vietnamese who went to the United States after 1995, the year the two countries resumed diplomatic relations. That's been the agreement since 2008. "After years of negotiating, Vietnam essentially agreed to take back people who came to the U.S. after 1995 but not those that came to the U.S. before 1995," says Phi Nguyen with the civil rights group Asian Americans Advancing Justice in Atlanta. South Vietnamese flags fly over businesses down Boston's Dorchester Avenue ahead of the 40th anniversary of the fall of Saigon. Now, the Trump administration wants to expand on that agreement to be able to deport Vietnamese immigrants who came here before 1995 and have committed a crime. Critics say some of the immigrants committed nonviolent offenses or served their time years ago, and many wouldn't have been considered priorities for deportation under previous administrations. Moreover, critics say, some of the immigrants came to the U.S. as refugees, seeking protection. 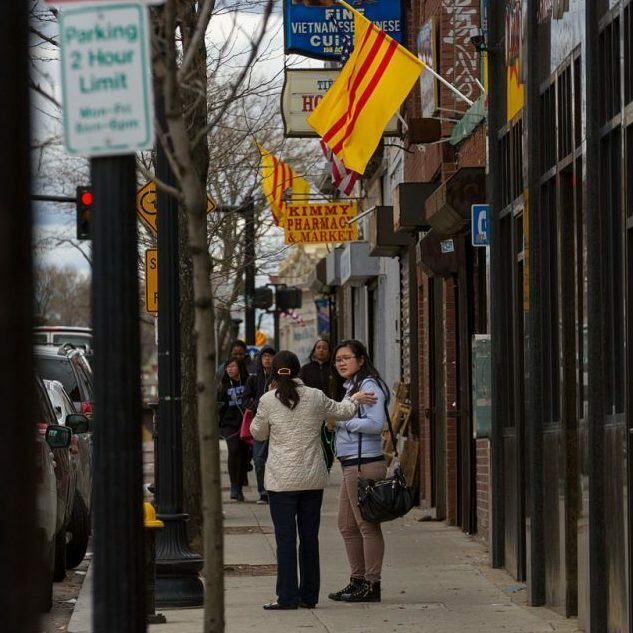 "They were forced to come here, in many ways, because of the war that was happening in their country," says Bethany Li, director of the Asian Outreach Unit at Greater Boston Legal Services. Vu was born in Saigon in 1967. His father was a U.S. serviceman fighting in the country, and he barely knew his mother. Vu says she abandoned him at a young age. He describes the relentless discrimination he faced in Vietnam, with people calling him a "dirty birth." I think about it often and I don't want to be deported. I wouldn't be able to see my children. I would lose everything. I would miss most being around my kids. Vu wasn't alone. Thousands of war babies were born into similar situations, facing isolation and derision. Many, like Vu, took advantage of a program that allowed Amerasians to get residency in the U.S.
Now, in Boston, he has a steady job, a longtime partner and two U.S. citizen children. He doesn't want to return to Vietnam, but he might not have a choice. "I think about it often and I don't want to be deported," he says, wiping tears from his face. "I wouldn't be able to see my children. I would lose everything. I would miss most being around my kids." Katie Waldman, a spokesperson for the Department of Homeland Security, says removing these Vietnamese nationals is a priority for the administration. They have been convicted of a range of crimes, from burglary and drug charges to violent crimes. Waldman declined to address efforts to renegotiate the agreement with Vietnam, and the Vietnamese embassy did not respond to multiple requests for comment. While government officials from both countries are not talking publicly, details of the talks did surface in a related court case brought by some Vietnamese immigrants over their detention by immigration authorities. Those documents show the two governments have been negotiating since at least 2017. In court filings, Michael V. Bernacke, an official with Immigration and Customs Enforcement, said that the agency has been negotiating "to facilitate and return all Vietnamese nationals who have been ordered removed from the United States, regardless of when they originally entered the United States." For a time, starting in mid-2017, according to Bernacke, Vietnam "verbally agreed" to process travel documents and accept immigrants who went to the U.S. before 1995. Court documents show at least 10 immigrants were deported. But later on, according to the filings, Vietnam appeared to reverse course and seemed unlikely to take back more pre-1995 immigrants. So Bernacke said that "ICE will continue to negotiate with the Vietnamese government." Nguyen, the Atlanta-based attorney, says the private nature of these talks is stoking anxiety in Vietnamese communities. "A lot of these conversations do happen behind closed doors, and there's always the fear that something could change tomorrow," she says. 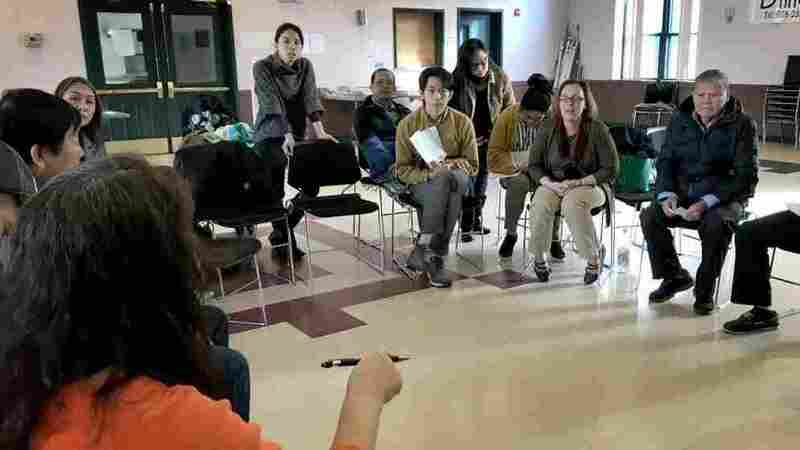 On a recent Saturday afternoon at a community center in the Dorchester neighborhood of Boston, more than a dozen people sit in metal folding chairs, organized in a circle. They lean forward, listening to the free legal advice being offered. They're all here because they're worried, including Van Nguyen, who says she fled Vietnam and came to the U.S. as a refugee in 1980. She is not related to Phi Nguyen. "I mean it's kind of, like, hitting home because my husband does not have citizenship, and he's got a past. So we're just kind of very nervous," she says. Nguyen declined to elaborate on her husband's past. He's Amerasian and they worry he could one day be deported to the country that so many fled more than 30 years ago.